There is no shortage of places to eat and drink in the Pollensa area of Mallorca (Majorca). In fact there are well over 100 cafes and restaurants. So we have only included a selection here. Do also have a look at our Restaurant Forum with reviews from previous visitors. If you have any recommendations, please add them. A variety of food is available from the international chips with everything to Chinese, Indian, Italian, French, Swiss etc. But to experience the real Mallorca, you must try Mallorquin cooking - from the simple but heavenly Pa amb Oli (bread with oil), tasty Coca (a sort of pizza), delicious Tumbet (ratatouille with potatoes) to Lechona (roast sucking Pig). And if you are a fish lover, you will be in heaven. the taste of a place Mallorca - highly recommended! If you're staying in Puerto Pollensa you will have no problem in finding somewhere different to eat every night. Do however make at least one trip into Pollensa town and enjoy a special evening out. Enjoy! FOR PERSONAL USE ONLY - thank you! View a Google Location Map of restaurants, bars & cafes in Puerto Pollensa, Majorca. Celler La Parra first opened in 1962 and serves authentic Mallorcan cuisine, satisfying the heartiest of appetites, in a friendly family atmosphere. Brothers Jaime and Alex will welcome you into their typical Mallorcan cellar where, traditionally, wine was made and sold. The restaurant has been in the same family for three generations and everything is made fresh on the day in wood burning ovens in a warm, friendly and rustic environment. Specialties include; Paella, frito malorquin, lomo con col, tumbet, tongue with capers and roast chicken. Located right at the beginning of the Pine Walk, Corb Marí boasts over 40 years of experience. Offering the best meat from the north of Spain as well as fresh fish from Mallorca and the Galician coast, all cooked on a Mallorcan oak BBQ. Other dishes on offer include traditional rice dishes as well as snacks that can be enjoyed on the terrace between 12 and 4 pm. Also available is an extensive wine list including wines from all over the world. There is live music at the hands of saxophonist David Giverin every Thursday evening. An Oasis of fine food and family fun. At the Formentor end of Puerto Pollensa Bay, you will discover Laguna, an oasis of calm with beautiful, by the pool cuisine. Situated behind the Illa D’Or Hotel (just off the Pine Walk) Laguna is open daily (April – October) for breakfast, lunch, snacks, dinner and drinks until late. Luggage storage on changeover day while you use our facilities. Want to host your private function here? – celebrate anything from birthdays to anniversaries, weddings or reunions – speak to Miguel on 971 864919 or email him at info@lagunapollensa.com to tailor an event to suit your needs. There are two entrances to Laguna: The Bar side entrance is on the main road behind the Illa D'Or Hotel, just off the Pine Walk (if you approach passing the Singala Hotel it is approx. 200m further along); or Poolside via the Laguna gate on the Formentor road, opposite the Bellresguard complex. Visit www.lagunapollensa.com for more information menus and details of entertainment. From 1st December to 6th January open Thursday, Friday, Saturday, Sunday. Anna and Bruno, along with their friendly staff, welcome you to a genuine Italian restaurant with a superb atmosphere. Enjoy sitting out on the large terrace looking down towards the Pine Walk beach. The delicious homemade Pizzas, Pastas and desserts are made with imported Italian products. To accompany your meal we have a good range of Italian wines and spirits. Love life - Live Laroc. Take away is also available. Come and visit is in 2015 and see our newly renovated premises, same people, same food, but new deco!! 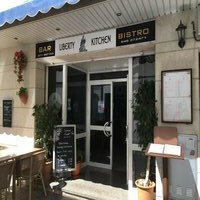 Liberty Kitchen (formerly known as Hell's Kitchen), a Warm and Relaxed dining experience with an international menu and prices to please everyone. We are situated on a pedestrian walkway, 2 minutes from the beach and our terrace is perfect for all you al fresco diners. from 12.00 to 23.00 hrs. This traditional restaurant reopened its doors January 2006 after a three-year break. With a new atmosphere, a stylish décor and its still breathtaking views over Pollensa Bay and the harbour, the new La Llonja Restaurant offers a wide choice of cold and hot starters such as a warm seafood salad, fresh whitebait or shrimps, cured Jabugo ham or the local fish and seafood rice marinera. You will find a large selection of main courses based above all on fresh fish from the grill (sole, sea bream, hake, turbot…), the famous lobster calderette, mixed paella, and just a few but premium meat courses like Majorcan spring lamb cutlets, sirloin steak or a chicken skewer with fruits and curry sauce. A menu of the day at 32.90 € including wine, water and coffee, homemade desserts, sugar free desserts, a few vegetarian dishes and a list of selected wines make up the offer under a most attentive and efficient service. FRESH, GENUINE AND HOME MADE AMERICAN AND MEXICAN FOOD. A great family restaurant with a real American diner feel, including an entertainment area with the only pool table and pinball machine in the square. Come and try our wonderful grilled meats, we offer all the best: black angus, irish fillet, etc. And you just have to try one of our homemade iced cocktails, perfect for those hot summer evenings. New for 2015 we have a gluten free menu that includes pasta dishes, pizzas, burger and hotdog rolls, ice cream, beer and much more. Ask anyone local about Nicos, they'll only have good things to say, rumour has it we have the best home-made burgers and chilli in town, if not the whole island! Mention www.puertopollensa.com and get a free glass of sangria!! Nostalgia is unique in the port, being a Bar & Bistro during the day and evening, turning into a smart night spot for all ages from 10.30pm onwards. Enjoy the homemade cuisine prepared by our renowned chef, specialising in meat & fish from the char grill, authentic Thai dishes and many others – look out for specials! The kitchen opens at 10am, serving breakfasts, lunch and snacks during the day and dinner from 6pm – 10.30pm. The smartly designed interior is fully air conditioned - lovely and cool in summer, warm and cosy in winter! You could just pop in for a drink and a chat with our friendly staff, or sit al fresco on the terrace watching the world go by. From 10.30pm onwards Colin Sweeney sings Swing, Frank Sinatra, Michael Buble, Motown and Oldies. Enjoy the fantastic atmosphere in Nostalgia. Music for all ages (golden oldies to the latest in the charts) provided by owner/DJ Colin. Dance the night away or have a crack at Karaoke (massive collection). Selection of draught beers, wines and cocktails (made from branded spirits and fresh ingredients – no pre-mixes here!) all at reasonable prices. Air conditioned, and situated just behind the church square ´El Posito´ is one of the best value restaurants in the Port. Famous for years for its fresh fish from the bay, Paellas, Mussels and variety of Tapas. Its friendly family atmosphere, makes this a place to come back to year after year with many family and friends. Enjoy our authentic Mallorcan Cuisine brought to you by our chef ¨Toni Planas¨ whose 40 years of experience has led this restaurant to reach its excellency. OPEN TO EVERYONE, parking available, the Club Nàutic restaurant has been open since 1970 and provides Spanish and International specialities served by friendly staff in the incomparable setting of the Pollensa Marina. Organising a banquet? We can cater for up to 300 people, in the finest venue in Port de Pollença, please enquire about our competitive terms. Open 365 days a year serving food from 12 noon to 10.30 pm. Over the years, Stay restaurant has achieved a recognized gastronomical position in the area. It has strengthened a personal seal in which naturalness and constant renewal are combined in the elaboration and presentation of a market cuisine, including among many other products, a great variety of fresh fish, graze lamb, selected livestock yearling lamb and imagination rich desserts. We also have a great variety of Tapas and snacks at lunch time. The Stay restaurant and terraces all have WiFi, and we have just installed a Life-Cam on our website. 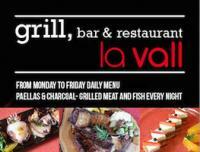 Grill, Bar & Restaurant La Vall. La Vall - Grill, Bar and Restaurant offers a great selection of charcoal grilled meats and fishes, as well as paellas and many other great dishes. The lunchtime Menu Del Dia offers a a wonderful selection of local dishes, and at just €9, for three courses, including a drink is great value. If you come once, you'll be back!! Free WiFi is also available. Look for us on Tripadvisor and please leave a review! The kitchen is open from 12 'till 16 hrs & 19.30 'till 22.30 hrs. The Restaurant "Ca´n Cuarassa" is situated on the beach of the same name at the end of the beautiful Bay of Pollensa. It is one of the best preserved areas in the north of Mallorca, between Alcudia and the Port of Pollensa, and less than 2 km from this last town. With a large garden surrounded by palm trees and tamariscs. An ample and well balanced menu, with Mediterranean flavour, based on local market produce, includes among other starters a great variety of fresh pasta, and also fish and meat dishes of excellent quality prepared on a charcoal grill. All the bread and desserts are home made, and an extensive wine list completes our gastronomic offer. Fresh salad bar, deli sandwiches, wraps and panninis, quiches, pasta, spit roast chicken, 100% home made beef burgers, beer battered fish and chips, and much more! Enjoy your meal without the wait and pre-order in advance. Don't forget to ask for our outside catering service, we deliver to homes, hotels, fincas and the beach!!! Come and enjoy some typical Mallorcan food. We offer a Dish Of the Day, including a drink desert and coffee for just €6.50! We have a great selection of tapas, visit us between 12 am and 3.30 pm or 7.30 pm and 9.30 pm and enjoy a free tapa with your drink, if you come on a Thursday evening you can try one of our special tapas. And of course don't forget our wonderful pamboli's, you can't leave Mallorca without trying one. We also offer hamburgers and a seletion of food for children. If you are a bit peckish in the early hours, remember our kitchen is open until 3.00 am, so no need to go hungry. Open All Year round apart from 10 days at Christmas. Alonso and Xisca would love to see you at their Bar/Café Rumbo. They offer homemade, traditional Mallorcan tapas that change every day depending on the foods that are in season. You can also try a typical Mallorcan Pa Amb Oli, made from local bread and the best Spanish cheese and cured ham. As well as this they offer fried baby squid, croquettes,”pimientos padron” (small spicy peppers), squid rings, etc. And not forgetting the pizzas, paellas, cheese and/or ham platters, salads… and this summer try our "DISH OF THE DAY"!! 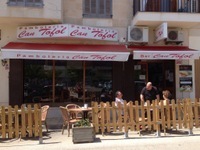 Enjoy Authentic Mallorcan cooking in a typical Mallorcan environment, set on the main road where you can watch the world go by. 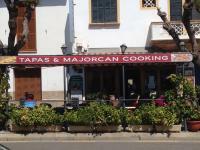 NEW - View a Location Map of restaurants, bars & cafes in Pollensa Town, Majorca. Celler El Moli is situated in the old town of Pollença and was originally a Flour mill. The very best of local cuisine is served in the unique atmosphere of an authentic Mallorcan celler restaurant. Various Spanish and Mallorcan tapas are available all day. Take away Paellas are available on request. We also have a children´s menu. 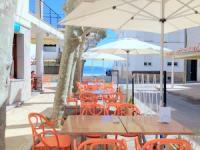 NEW - View a Location Map of restaurants, bars & cafes in Cala San Vicente, Majorca.